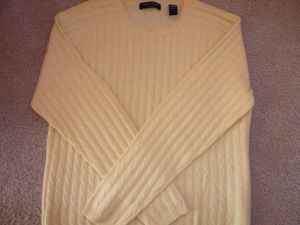 theAd>>This sweater is yellow, size large in excellent condition, only worn ONCE!! I'm 5'8" and this sweater is a little short on me. It was purchased at Macy's for $100. Great! You can give the gift of looking like a fancy Butter Ball. The kind you get at brunch, that's sitting in ice, you pick it up with those little fancy tongs...got the picture in your head? Yeah you want to look like that...right?